Dublin the Golden Sheltie (Golden Retriever / Shetland Sheepdog hybrid) at about 6½ months old—his owner says, "At close to 7 months, he is about 35 lbs. He is a very active pup…runs with and chases other dogs in the park and is also very good at retrieving sticks and balls. He definitely does shed, but did so noticeably more for about 2 weeks in April – May. His ears sometimes flop over and sometimes stick straight up." 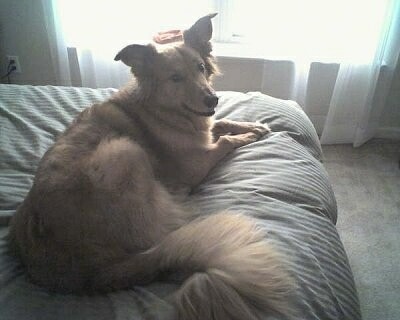 The Golden Sheltie is not a purebred dog. 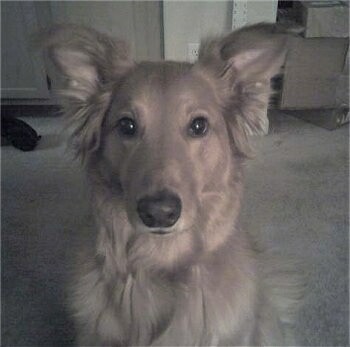 It is a cross between the Sheltie and the Golden Retriever. The best way to determine the temperament of a mixed breed is to look up all breeds in the cross and know you can get any combination of any of the characteristics found in either breed. Not all of these designer hybrid dogs being bred are 50% purebred to 50% purebred. It is very common for breeders to breed multi-generation crosses. "Zeus (male, 67.5 lbs.) just turned 7 in these pics. 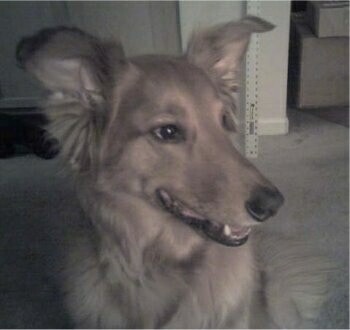 He is a Golden Retriever / Sheltie mix. He has the temperament of a Golden; very gentle with children and strangers...and the energy and endurance of a Sheltie; he will run top speed until out of my sight, but not his. I haven't seen any retrieving or herding skills...and I've owned an AKC black Lab previously, and recognize those traits, but am not experienced with the Shetland. In any case, Zeus's opportunity to demonstrate either are limited, since he is a house dog. I got him in Phila., PA and the breeder is no longer listed. In terms of quality of companionship, this dog scores 12 out of 10. Of course with mutts, I'm just lucky."